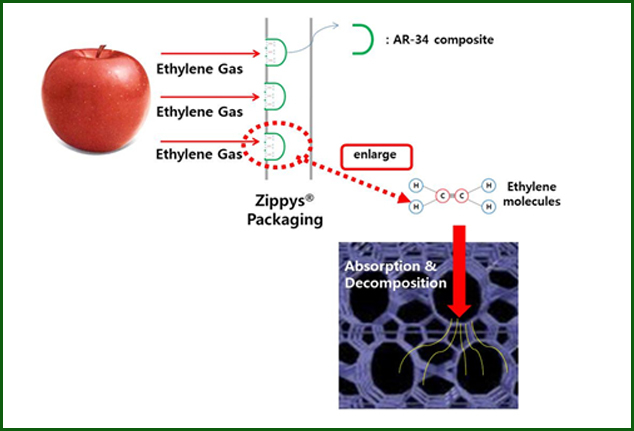 'AR-34(Anti-Rot 34)' : The complicated polymer containing multi-functional natural materials. The core materials of the active packaging developed with independent patented technology is AR-34(Anti-Rot 34), the complicated polymer containing multi-functional natural inorganic materials. For developing the advanced materials of freshness-keeping, hangreentech have worked together with Seoul National University, domestic and overseas research institutes. 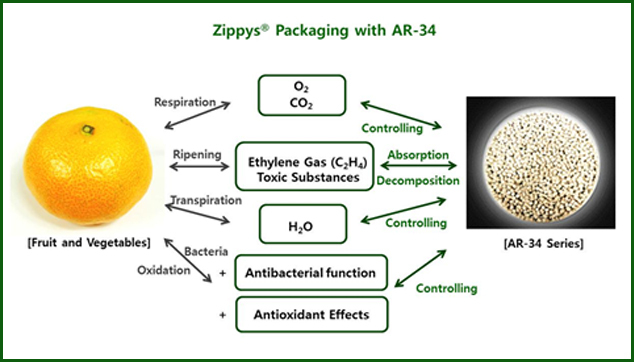 All our packaging on which the trademark of Hangreentech(Zippys®) are printed are produced with 'AR-34 series', the advanced polymer composite compounded with more than 10 natural materials keeping fruit and vegetables fresh longer. All our functional packaging(PP film, wrap film, fresh pad, and bio-fresh tray) made with 'AR-34,' the new materials of Hangreentech extend the shelf life innovatively and stay the contents in our packaging fresher as well as they have the merits of existing synthetic resins, such as blocking harmful substance, absorbing impact, maintaining humidity. In addition, another material 'HAP-3' restrains bacteria and fungi generated in the process of food storage effectively. The freshness-keeping technology and the applied packaging have already been registered both domestic and international patents, and have passed the safety criteria of US FDA and Korea FDA. Hangreentech has obtained certification of ISO 9001(Quality Management System) and ISO14001(Environmental Management System) respectively related to the production system of freshness-keeping materials and packaging. We have established our production system and self-grinding powder process satisfying the HACCP condition.